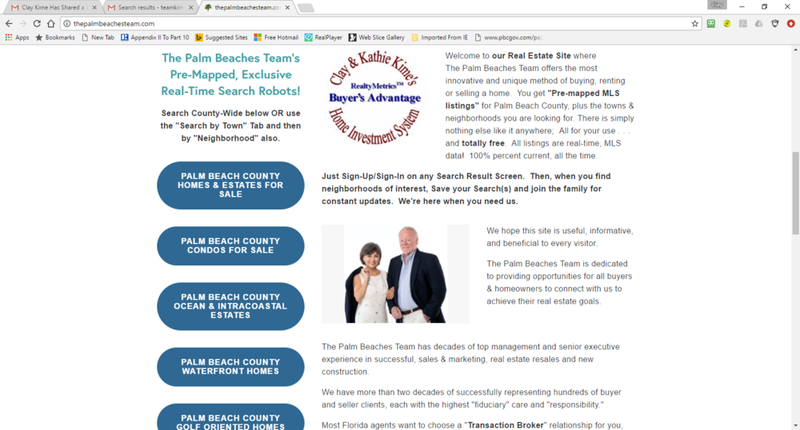 True, ThePalmBeachesTeam.com looks, feels and behaves very differently than all real estate agent web sites, doesn't it"?. This is by our very deliberate strategic, custom design, and not born of some canned, whiz-kid web page template, but from 30+ years of our extensive real estate experience . We custom developed the ThePalmBeachesTeam.com site, in-house, with a purpose that transcends the self interests of any real estate agent or broker or commercial real estate search site. All our listings are 100% currently active listings. Virtually all the national real estate web sites mix active listings with pending (under contract) listings. Unless you are willing to really dig, it's nearly impossible to determine if a listed property is actually "for sale." This is why our site is the preferred home-search site of choice among buyers. Whether you're buying or selling . . . . It's always about YOU! Buyers looking their first home or right-sizing into their next home, we have designed the most user friendly home search resource in all of Palm Beach County, Florida. Featuring Pre-mapped, graphical, map-based searches by County, Town, City, Village and Subdivision . . . It's just plain fantabulous! So why did we do this? Because we wanted to create "the" internet destination for all internet searches for homes, condos & commercial properties "anywhere in Palm Beach County, Florida." We did it to benefit everyone! Better that Realtor.com, Zillow, Trulia, et al . . . Yes! Most sellers, never actually tried them. So go ahead any try them out. Once you get through all the pesky advertisements and deal inducements, you still have to wrestle with their search bars, and pages of checklists and retype them many times to find what your're looking for. While the mega-search companies are really there to sell "Advertising" to businesses and other realtors that then want to sell something else to you. They are not dedicated to helping Buyers find Your House. At ThePalmBeachesTeam.com, we never sell advertising to anyone. ThePalmBeachesTeam.com is only about the pure home search experience that brings those buyers to you. And forget about those el-cheapo canned-search programs the local brokers use. They are extremely clumsy and just a pain to use. With our awesome, proprietary search tools; The ability to find your desired neighborhood(s), subscribe to our free "instant, automatic updates" to real estate activity in one or more areas; Free Census Bureau demographics drilled down to each city/town; Comprehensive data for Residential Sales, Rentals, Condos & Apartments, plus we even added Commercial Properties throughout Palm Beach County. It is one-of-a-kind "special." It's all "point-and-click." Q: Since I'm a seller. Why should I care about some hot, new-fangled, house-finding real estate search site? A: Darned good question! And we are so glad you asked. Every seller is anxiously looking for "buyers", right? So where do you, as a seller, find those buyers? Well . . . the more important question is, "where and how do those buyers find You and Your House?" There's only one place; Only one platform; Only one resource; rolled into a single, integrated system; It is ThePalmBeachesTeam.com, the all-in-one solution that makes it happen. County-wide map-based listings, City, Town and Village map-based listings; even featured neighborhoods, Selected, "Featured Listings" by town; Both Sales & Rentals, Residential and Commercial, you name it, we have it all covered for you! Whether your buying, selling or renting, come, sign up (it's free) and join the family and let us help you achieve your real estate goals.